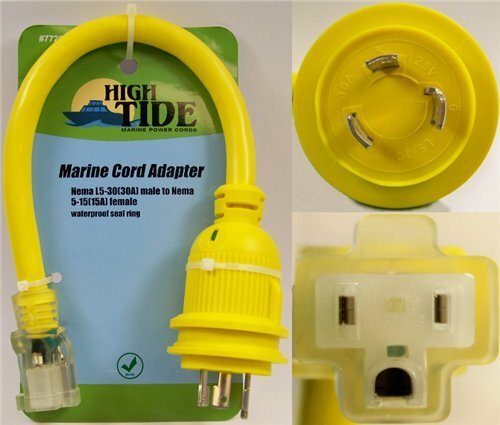 High Tide Marine Cords presents our heavy duty Locking 30 Amp to 15 Amp Dogbone Adaptor. This adaptor changes from a 30 Amp source to a 15 Amp source. Heavy Duty 10/3 Gauge Wire Bright Yellow Color for Improved Visibility 18 inch overall length LED Indicators at plug and receptacle. The LEDs let you know when the power is connected!